Sharp, Lexmark and Canon have all announced new ranges of machines in recent weeks, and the new year launches are not over yet! 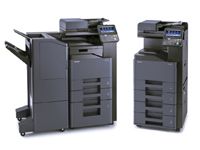 Now Kyocera are rolling out three new color A4 multifunctions, the TASKalfa 306ci (32ppm), TASKalfa 356ci (35ppm) and TASKalfa 406ci (42ppm). The new A4 machines offer the same features as Kyocera's A3 MFPs. Following the trend set by Samsung, Lexmark and Oki, Kyocera is now producing advanced A4 multifunction printers. Among their many features, we note a wide choice of finishing units (internal or external stapling, punching, mailbox), a large paper capacity up to 3,100 sheets (max if all options taken), a 7-inch adjustable color touch screen, a card reader and the ability to print banners up to 1.22m (4 feet) long. These new A4 devices also run HyPAS, Kyocera's development platform, so they can support the full range of software solutions that their A3 stablemates can. Find more information soon on your DMO portal.